Review: Not gonna lie, I loved reading this book. I’m all about books with strong narrative voices, and Not Otherwise Specified definitely delivered. Etta, the main character and narrator, doesn’t fit into her small hometown in Nebraska. She’s black, bisexual, and recovering from an eating disorder. Still, she’s got confidence and strength to spare, and that carries through her engaging narration of her journey to get into Brentwood, a fancy theater school in New York, and her growing friendship with Bianca, another girl in her therapy group. For the most part, the book manages to portray quite a few facets of Etta’s life with nuance. Etta’s former friends, known as the Disco Dykes, shun her for being too bisexual for them. Meanwhile, her mother is hesitant to embrace Etta’s identity. And, Etta is aware of how she stands out from her white townspeople, as well as the attitudes of people who don’t understand her struggles with her eating disorder. Aside from all that, Not Otherwise Specified was an enjoyable read. I would have liked several plot threads to have been expanded on, and I hope there’s a sequel to follow up on these things. Plus, I can’t get enough of Etta herself. Etta’s passion for dance, and the musical theater references sprinkled throughout, really make the book. These details, as well as Etta’s character, make the book one worth reading. This is definitely a book that hits the top of my list of distinct teenage narrative voices. I will definitely be looking up Moskowitz’s other books to read when I have the chance. 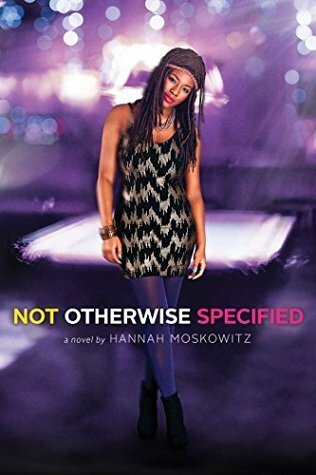 Read Not Otherwise Specified if contemporary, realistic YA fiction is your thing! Recommendation: Get it soon! This book comes out March 3rd, 2015.